My mom finished her radiation treatment on Friday; she wore a mask (like this one) to keep her face from moving during each of her 18 radiation sessions. 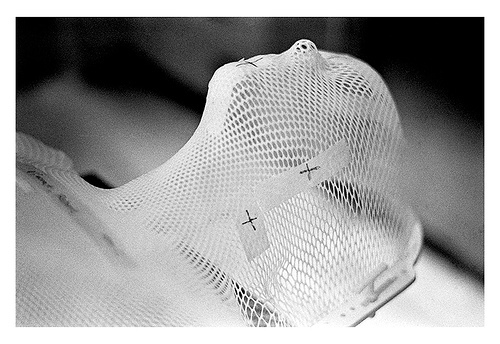 For her, the mask was very uncomfortable, but I think she was extraordinarily brave to undergo treatment, knowing that her type of brain cancer is terminal. She put on the mask to have more time on this earth to spend with her grandchildren. I don’t know how much time she has, no one does; not knowing is not easy, but we are taking this all, one day at a time, and I think that her determination is a reflection of the love she wishes to share…..
At the end of her treatment on Friday; my mom asked to keep her mask; she is going to make it a piece of art.I can’t wait to see what she creates. Throughout my mom’s treatment, I have been contemplating masks and why we wear them; a mask protected my mom; positively or negatively, we each have our own reasons for wearing masks; but the motivation is not always to hide or conceal; sometimes, it’s meant to heal. So, be sensitive to the needs of others; you never know what they will reveal…..
Make the most out of every day…. free from fear, despair, and sorrow.